The KP-2BS access controller is the base link of the access control subsystem within the ULISSES Integrated Security System. When combined with the IPS network security system concentrator, this controller enables building a reliable and secure system for managing the security of distributed facilities, creating the PALLADION global Security Management System. 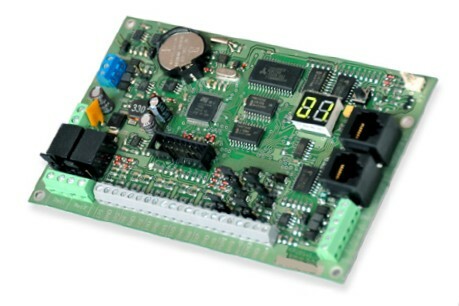 Depending on configuration, the KP-2BS controller provides complete support for a single passage (with both single, and double leaf door), or one-way support for two independent passages. This controller supports typical elements of passage control and security, such as access control readers, electromagnetic door lock, electric strike, door opening buttons and door open sensors. Operation with a wide range of Wiegand standard readers, like code keyboards, proximity card readers (including those compliant with the commonly used UNIQUE and MIFARE standards), and biometric readers, allows the access control system installed to be easily adapted to the user’s requirements for security level, convenience of use, functionality and aesthetics. passage operates in stand-alone mode. Installation, configuration and management of the KP-2BS controllers operating in stand-alone mode is supported by the KPView service program. It allows for configuring the passage (available types include: one-way passage, two-way passage, mantrap-type passage, special passage with coincidence, passage with the work time recording function), testing the RS485 link parameters, reading current states of inputs and outputs of the controller, programming the user database, defining time zones, as well as reading event history. time and attendance system terminal (i.e. work time recording).